We just got this beautiful new 2018 Status 45ft motorcoach in and it is ready to go! This has all of the ammenities of home and the best part is you can take it with you. 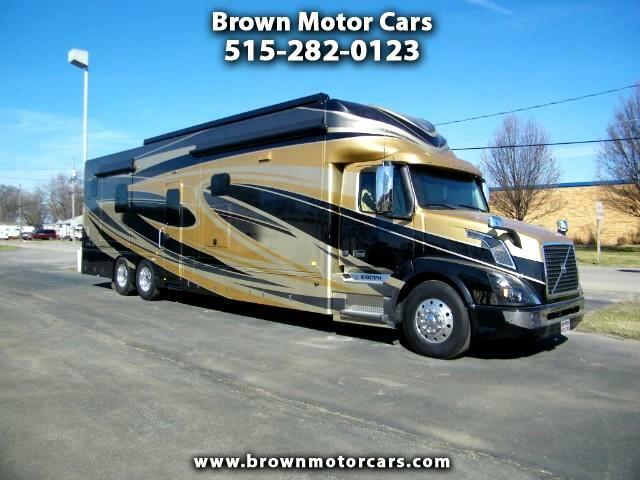 This gorgeous motorcoach has full body paint, plus it's built on a full Volvo semi chassis and is capable of hauling 40,000lbs, so you can take all of your toys with you as well! It has 4 slide outs which opens the floor plan on very well and makes it very spacious. It has real tile flooring with in floor heat, full size side by side stainless steel refridgerator, stainless steel convection oven, electric 2 burner stove top, 2- flat panel tv's in the living room and one more in the master bedroom, ceiling fans, real wood cabinetry, bath and a half set up, king size bed, power awning, in motion satellite, outdoor entertainment center w/TV and stereo system, outdoor refridgerator, rear and side camera's, 12.5k Onan Diesel Generator, and tons more! It has the bath and a half setup with the full size shower located in the master bath, and than has the half bath with stool and sink. This one is powered by a 600hp Volvo D16 Diesel and is paired with a 12 speed automatic transmission, so you can drive this with ease. There are tons of details on this coach so give us a call or stop out with any questions and we'd be happy to help you out!